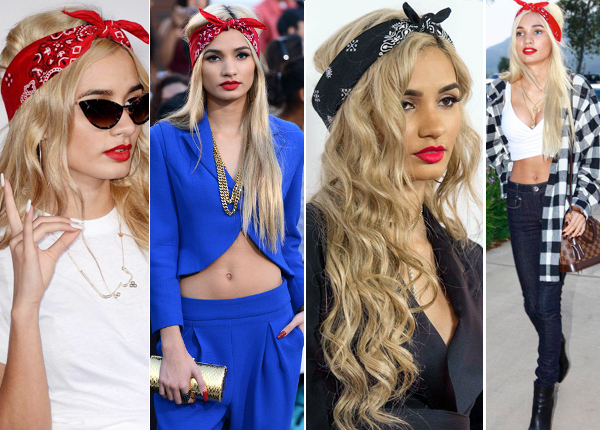 Bandana or Bandanna scarf is the hottest fashion accessories in 2015 autumn and it is not difficult for people to realize it! Bandana scarf is using the cotton material and the usual pattern is using the Paisley pattern. This kind of scarf is not born for fashion; it has many functions like you can tie the scarf on you neck when you are working under the high temperature; Athletes can tie it on their head in order to prevent the sweat from the eyes. Maybe it is because its functions, Bandana is loved by mane gentles and later, it becomes a fashion trend, some cowboy lovers and Harley lovers love Bandana pretty much! And now, this men’s trend has become the now trend of women, some designers use more colors, more materials and patterns to make the scarf chic! Between the summer and autumn, Bandana scarf is the useful single accessories. It can make you chic and the most important thing is this scarf is not cost you too much! The main manufacturer of fashion scarves used today is China, with India, Hong Kong and Indonesia close behind. The most common materials used to make fashion scarves are silk, fleece, pashmina and cashmere.